If the gutters on your home are clogged with leaves, dirt and other debris, rainwater may not be able to flow through them properly and discharge through your downspouts. This can potentially cause a number of moisture-related issues with your home. Check out a few common risks associated with clogged gutters below! When water can’t flow through your gutters, it will eventually spill over their sides instead. This, in turn, can cause water to pool around your foundation. Over time, moisture buildup around the foundation can cause the concrete to crumble and crack. A clean gutter system will ensure that rainwater flows away from your home, thereby protecting your foundation from water damage. A clogged gutter system can also cause rainwater to drain down your siding, leaving unsightly mold and mildew stains on your home. If you find that you’re constantly struggling to combat mold growth on your home’s exterior, it could be because your gutters aren’t functioning correctly! When your gutters are filled with heavy debris and water, the added weight can cause them to split and break free from your home. This can not only have a negative effect on your home’s curb appeal, but also allow water from the broken gutter sections to collect around the foundation. To keep your gutters working properly, be sure to clean them at least a couple times every year, preferably in the spring and fall. You may also want to consider having gutter guards installed. These can prevent debris from falling into the gutters and reduce the need for regular cleanings. To learn more, feel free to give us a call or contact us online today! 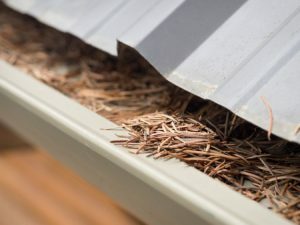 When your gutters are functioning properly, it can be easy to forget about them altogether. 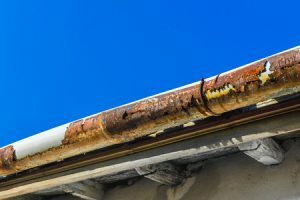 Once an aging gutter system falls into disrepair, however, it can be hard to ignore. You may notice unsightly mildew growing on your gutters, or find broken fasteners lying on the ground below the eaves of your home. But these aren’t the only indications of a gutter system that needs to be replaced. 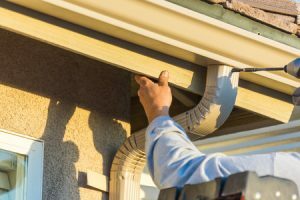 Today we’ll look at a few more tell-tale signs that it’s time to invest in new gutters for your home. Is the siding below your gutters getting streaked with mold and mildew? Do the fascia boards behind the gutters appear to be rotting? These are signs that your gutters are leaking and/or overflowing during rain storms. If you spot water damage around your gutters, inspect them closely for cracks, holes and rust. If the fascia boards behind your gutters are rotting, the gutters may begin to sag and pull away from your home’s roof. This problem can be exacerbated by ice dams and impact damage from tree limbs and other debris. You can try to reinforce your old gutters with new fasteners, but sooner or later they will need to be replaced. If you notice little gullies forming in the flowerbeds next to your house, there’s a good chance your gutters aren’t doing their job. Ideally, your gutters should divert water away from your home to prevent this type of erosion. If you notice erosion in your flowerbeds, you may also see water pooling around your home’s foundation. Over time, this moisture buildup can cause the foundation to crack and crumble. With this in mind, it’s important to have the problem remedied sooner rather than later. Are your old gutters in need of a replacement? Give us a call or contact us online today to learn more about how a modern seamless gutter system can help!